Staging your furniture properly will help your home show better on the real estate market and sell for more money. Home buyers often judge a home by its furnishings. Ugly or shabby furniture can give people the impression that the house is old and tired too and hasn't been well maintained. Let's face it, plenty of us have furniture that has seen better days and wouldn't look good under any light. You may ask, "Why not just show an empty house?" Because unfurnished homes can feel cold and stark. Plus, many buyers simply have no imagination and are puzzled by these undefined spaces. And contrary to common sense, rooms actually feel smaller without furniture! Additionally, empty homes have a tendency to linger on the real estate market far longer than a staged ones. But take heart. If your furniture is well past it's expiration date, there are a few affordable home remedies that can help. When it's time to stage your home for sale, select furniture that is neutral in color and style. If you inherited grandma's cabbage rose sofa in mauves and greens, or have furniture that's simply worn out, don’t despair! A slipcover may be all that's needed to neutralize an ugly pattern or loud color. Note: Some furniture is beyond redemption... shape is important. Even a slip-cover won't hide the shape of an ill-formed piece of furniture. In addition, if your furniture is too "taste-specific," such as a heavy Victorian chair with creepy clawed feet, you may want to put it into storage, (or have a yard sale!) then rent some modern furniture while your home is on the market. Taste specific: Not to everyone’s taste! You don’t need a lot of furniture pieces in a space, just enough to indicate the purpose of a room. Most of us can't afford all new furniture, but there are a few things you can do to disguise flaws and give your outdated furniture a fresh new look. Below are some options. Slipcovers are essential in the world of home staging! They hide shabby or stained fabrics, and can unify a room of mismatched furniture. Slipcovers are the most cost-effective way to update a room when staging your furniture. I use them in my own home as well. I like to use dark slipcovers in the winter and lighter in the spring for a refreshing seasonal change. Throwing an old horse blanket over a couch or chair won't cut it when you're trying to make a home sale. Slipcovers should be clean and unwrinkled, like they've never been sat in. My favorite source for buying slipcovers is surefit.net. This company has a wide selection of slip covers in many colors and styles and gets your order out fast. Other sources for cheap slipcovers: overstock.com, JC Penny, Walmart, K-Mart, Fred Meyer, Target, Amazon, and IKEA. Watch the instructional video below showing how to put a slipcover on a sofa. Video by PotteryBarn. When buying slipcovers for staging your furniture, avoid wild patterns and bright colors-- stick to neutral solids in colors like, linen, flax, loden, sage green, coffee, and cream. The downside to using slipcovers is that every time you sit down they become wrinkled and untucked. Sure Fit sells a product called, “Tuck Once,” a grip that you stuff between the cushions and arms of the furniture to keep the slipcover in place. You need more than one though, and they are a bit spendy. An alternative, (and one that I use) is to tuck rolled up magazines deep between the cushions. T-shaped upholstery pins can also secure slipcover fabric that's too loose. Slipcovers can also be used to hide ugly or taste specific dining chairs too. You can get covers for just the back, or for the entire chair. Here's a project for those who enjoy sewing; Make a slip cover to go over the back of worn out or too taste-specific dining chairs. Simply make a pillow-case like envelope out of a neutral colored fabric. Add a sash to each side and tie a bow around the back. Save money by using old sheets or curtains for this project. Sew a slipcover to go over an entire chair. Follow the detailed instructions on the video below by simple sewing. Renting furniture doesn't have to be expensive! All you need are a few well-placed pieces of furniture in each room to indicate the purpose of each room. Furniture Rental Source services EVERY state in America, including Alaska, Hawaii, and parts of Canada. Select your furniture online and Furniture Rental Source will deliver and install it in your home. You can also order bed linens from this company and they will even make your beds! Cort is another good furniture rental company, but this one services 65 countries worldwide! Or, select furniture you can lease to own, at Easy Home Furnishings. They'll deliver the furniture and even set it up for you. IKEA has showrooms located all over the U.S. that you can visit, or order furniture online. They offer a large selection of attractive and affordable furniture. Other sources for discount furniture: biglots.com﻿ and overstock.com. www.furnitureunfinished.com. This company services ALL the states in America, plus Canada. Really cheap beds for home staging! Get a couple cheap inflatable mattresses and just stack them up. Place them on top of a platform, or buy some inexpensive bed risers to raise the bed off the floor. Bed risers and inflatable mattresses can be found at Walmart, Target, Kroger, and other home supply centers. Don't make the mistake of putting the mattress on the floor, as the effect will be sloppy, and will scream, "dorm room decor!" See staging the bedroom and small bedroom decorating ideas for more home staging ideas. The cheapest way to furnish your home for is to borrow furniture from a friend. Or, rescue a piece of furniture you found at a garage sale, flea market, second-hand store, or the online classifieds, like Craig’s List, by giving it a brand new look. Refurbishing old furniture is a great way to breath new life to into pieces that would otherwise be too worn out or outdated for your home decor or home staging purposes. Maybe you already own a piece of furniture in need of some rehab. 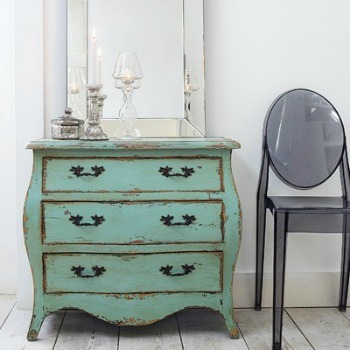 Create that shabby chic look that is so popular, or have fun adding new hardware to update a drab piece of furniture. Strip ugly paint off to expose beautiful wood grain below. If you get down to the grain and find that it's not so pretty, paint the piece instead of staining it. Choose a fun color and turn it into an accent or focal piece. When I was a kid, I rode shotgun whenever my mom went antiquing. We often brought home promising pieces of furniture in dire need of TLC. We refurbished armoires, dining tables, chairs, old treadle sewing machines, coffee tables, dressers, and more. We sold most of the finished pieces for much more than we originally paid, but kept some for our own use. Don’t waste time trying to refurbish furniture that's badly damaged or made from particle board. If you're an impatient person, veer away from furniture with intricate carvings or turned legs. These features require hours of extra work! Avoid pushing furniture against the walls when home staging; this creates “shouting” areas instead of cozy conversational areas. Pushing furniture against the walls will also make visitors feel like they have arrived in a doctor's waiting room. 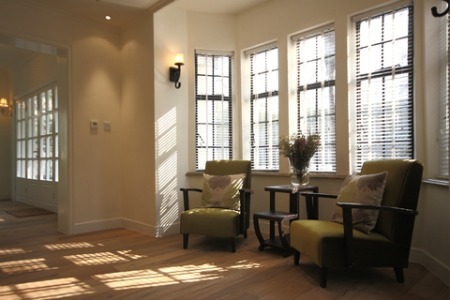 Instead, create “floating” conversational areas that are more visually appealing and make rooms appear more spacious. What does “floating furniture” mean? It simply means that furniture is not pressed against the walls. Instead, it's moved into the room and has an aisle space around it. This gives the illusion that the furniture is floating in the center of the room. Typically seen in open floor plans and lofts, floating a large piece of furniture will lesson the visual impact of that piece in the space, making the room appear more spacious. When staging your furniture in the living room, furniture should be arranged in cozy conversational areas and facing your most prominent focal point. These days the TV is often a competing focal point and finding the right placement for two focal points can be difficult. 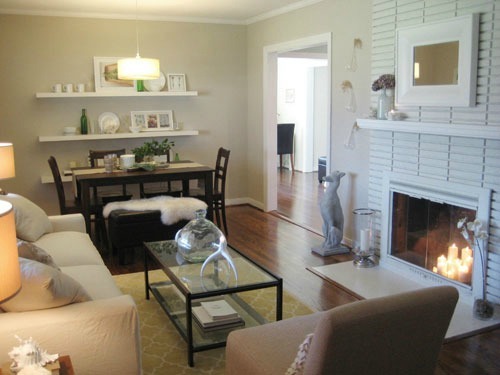 Interior designers have solved this problem by placing the TV above another focal point, such as a fireplace. What if the focal point is a large window with a stunning view and facing a different direction than the TV? Interior decorators often deal with this by placing an L-shaped sectional sofa in a room. Placed correctly, the L-shape sofa makes it possible to face two focal points at once. Another solution is to create separate seating or activity areas; sort of like having two rooms inside one. You might arrange a cozy furniture grouping in front of a fireplace or in a nook next to a lovely window, as in the photo above. Save your back (and floor!) and get some furniture sliders before you start moving heavy furniture around. Sliders are placed under the feet of the furniture to make the job easier. Furniture sliders are available at any home improvement center, Krogers, Walmart, Target, or amazon.com. One cheap option is to simply lay pieces of cardboard under the furniture feet. Another solution is to measure the furniture before you move it. Measure the outside dimensions of a piece to see if it will fit into a space before you expend the time and energy dragging it into place. Sofas and loveseats are the largest pieces of furniture in most living rooms and help to anchor a room. They are often a problem because of their size or bulky shape. Placing a sofa against the wall is boring and unimaginative. If your living room is so small that there's no other alternative, place it at least two inches from the wall. Avoid placing your sofa with the back facing an entry, unless it's a low-profile sofa. This furniture position is considered unwelcoming by feng shui advocates. Another home staging tip is to angle your sofa. Angled furniture is psychologically more inviting to people entering a room. Sofas and chairs should be the close to the same height. The difference in height should be no more than five inches. If you're arranging in a traditional fashion with a sofa or loveseat facing two chairs, the chairs should be matching, similar, or color-coordinated to achieve a nice balance. Upholstered chairs work better and look more inviting in living room areas. Smaller or wood chairs should be used for extra seating. You never hear anyone say they just want to plop down in a wood chair with a good book! Avoid placing too many small chairs with spindly legs in one area-- this will make a room look cluttered. As a rule, end tables shouldn't be too high or too low, no more than 2 1/2 inches higher or lower than the arms on sofas and chairs. 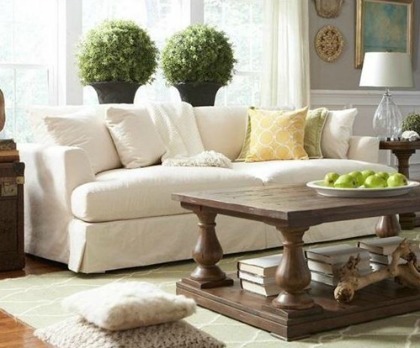 If the legs are showing on your upholstered furniture, avoid putting a “leggy” end table next to it. Try adding a piece without legs, such as a chest, a trunk, or a drum shaped table. A favorite designer trick for small spaces is to use a glass coffee table. The fact that you can see through it gives the illusion of a larger room, because it takes up less visual space. A console is typically placed against a wall or behind a sofa. They're useful for staging accessories like lamps, plants, candles, and photographs. Try to keep this table three to five inches lower than the back of the sofa, and about 3/4 the width of the sofa. This is not a hard and fast rule, just a guideline. Heavy pieces of furniture like these will usually become a focal point in a room because of their sheer size. Armoires can be found in a variety of styles to fit any home decor. They serve as closets, entertainment centers, offices and china cabinets. Remember to balance large furniture with something of equal visual weight on the opposite side of the room. 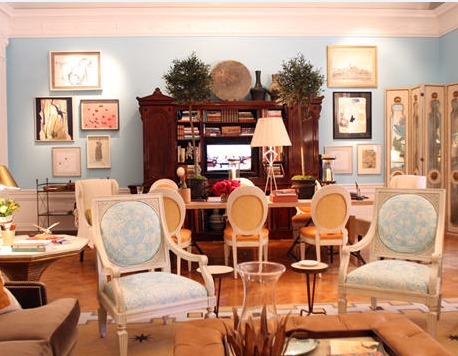 A sofa, huge chair, a window, or a table with a piece of artwork or mirror over it will offset the weight. Leave 1 1/2 to 2 1/2 feet of space around a bed. The space between twin beds should be between 1 1/2 to 2 1/2 feet. To make bedrooms look more spacious, swap out a big bed for a smaller one in the space. Have at least three feet of walking space in front of a dresser for opening and closing drawers. Don't crowd master bedrooms with huge, matching "suites" of furniture. It'll only make the bedroom look crowded. Leather or upholstered ottomans are a versatile piece of furniture and extremely popular in home decorating right now. Ottomans come in a variety of colors and sizes, serve as coffee tables, extra seating and even storage (if the top lifts off). These multi-functional furniture pieces will fit comfortably in any home decor style. The table should be in scale with the size of the room. Stage the dining table by removing all but four chairs-- this gives the illusion of more space. Remove one or two leaves as well, especially if the room is small. For larger spaces, you may need leaf extensions and more chairs to fill the space. You should have two to three feet of space behind a dining chair so people can get in and out of their chairs comfortably. A well-balanced and classic conversation arrangement, lacking only a piece of art over the sofa! When staging your furniture, place the largest furniture first, like a sofa, an armoire, a bookcase and entertainment center. When you're happy with the arrangement, fill in with smaller pieces like a coffee table, end tables and a sofa table (console). 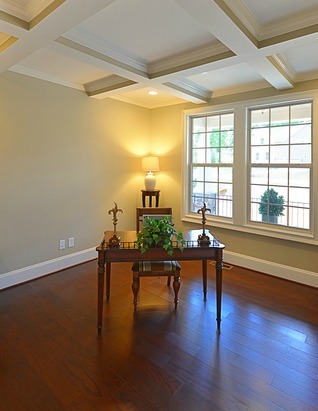 Create a conversation area like the one in the photo to above. Notice how the furniture is all in scale; the end tables are the same height as the sofa arms; the coffee table is in scale with the sofa and upholstered chairs. Nothing is jarringly out of proportion. The only thing missing from this picture is artwork or a mirror above the sofa. A sofa can be balanced by two upholstered chairs or a loveseat. An armoire can be balanced by a bookcase or fireplace on the opposite wall. 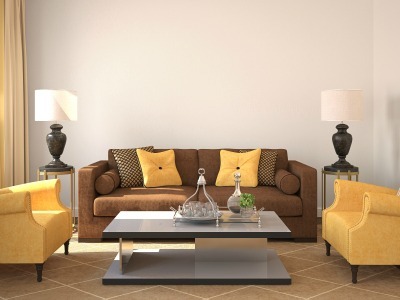 When staging your furniture, choose furnishings that relate to each other through form, color, scale, or style. When staging your home for sale, avoid mixing too many different styles, as in the eclectic look. It takes a deft hand to achieve this room design. Too many different shapes, colors, and styles can be confusing to home buyers. Create balance by repeating shapes, patterns, and colors in the furnishings, lamps, candlesticks, artwork, etc. A balanced room imparts a feeling of comfort and this is how you want home buyers to feel as they walk through your home. See art of accessorizing for home decor ideas. Be aware of traffic flow, (how people move through a room) and don’t crowd furnishings together. Have at least three feet of space around arrangements for maneuvering; 3 1/2 feet is better. Does the furniture serve the function of that room? If not, maybe it doesn’t belong there. When staging your furniture, avoid putting heavy and large pieces of furniture directly near the entrance or exit of a room; this creates an unwelcoming entry. Be sure to coordinate furniture bearing metal features, (arms, legs, drawer pulls, etc). The metal should match for a unified look. Furniture arrangements should be approximately eight to nine feet from their focal points. Don’t let a piece of furniture stand alone, unless it's a beautiful accent piece! Create groupings, such as pairing a chair with a side table and lamp, or two chairs with a table between. If you can see from the doorway to the farthest point of a room, this will give you the illusion of more space and length by extending the sight line. Vary the heights of furniture, art and plants to prevent boring rooms. Not too extreme, though-- you don’t want to create a roller coaster effect. See home interior design rules. Place your furniture in diagonal positions if possible; this makes your room look larger and more inviting to home buyers. Be sure that furniture is in scale to the size of a room. If you have a sectional sofa that encompasses the entire living room, try breaking it up into separate conversation areas. Hide the unfinished ends with end tables. Borrow furniture from family or friends. Create two separate conversational areas in a large oblong room by using area rugs. Area rugs will help define each space as a separate zone.